Bug fixes for some printers with the USB Disk (we sent an email to users who must upgrade the firmware). If your printer comes with a microSD card, you don’t need to upgrade your firmware. Please follow these steps to check if your printer is upgraded successfully: connect the printer to the computer -> open Snapmakerjs -> In the console section, enter M1005 -> check the result. If the result is the same as the following picture shows, the upgrade was successful. [Solved] How Do I know if my firmware update was applied? This version will has this known bug. After upgrade, the .bin file will be deleted from the USB Disk automatically. Added limit switch for 3D printing. After you turn on the laser or CNC using the touch screen and then go back to the home page, the laser or CNC will be turned off automatically. When there is something wrong with the thermistor, the touch screen will keep showing the temperature instead of showing the reboot screen. It will help identify the problem you encounter. Only products come with the USB Disk can upgrade the firmware. After you upgrade the firmware, please go to Control > Home Axes every time you turn on the printer so that the limit switch recognizes where the work area is. You can check the About page for the firmware version after the upgrade. Compatible with 1.6W Laser module. Bug fixed for controllers in the April batch and later. 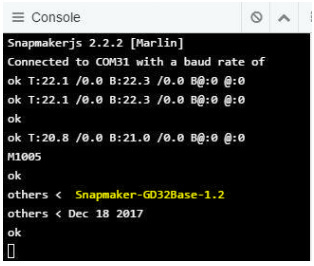 If you upgrade the firmware to this version, please upgrade Snapmakerjs to Version 2.3.2 or above. If you only upgrade the firmware without upgrading the software, the software will have trouble recognizing the laser engraving module. bug-fixed: now the touch screen will be locked correctly when printing is started by Snapmakerjs. bug-fixed: the CNC carving module will wait for the bit to complete spinning up when users resume the carving via the touch screen. added Enclosure Door check (only for laser). bug-fixed when stopping a print. bug-fixed for the USB disk read error when the machine is printing. It’s ok to re-upgrade your machine if you use the wrong version. If you choose the Enclosure version but you don’t have the V1.1 enclosure, the 3D printer and CNC carver can still work properly. However, the laser module will not start engraving after you choose a g-code file. Only products that come with the USB Disk can upgrade the firmware. Improved user experience regarding the enclosure Door Detection feature. In V2.6, you had to select the correct .bin file according to the version of your enclosure. With the firmware V2.7 and Snapmakerjs V2.5.0, you don’t need to select between .bin files. Instead, you can choose to use the Door Detection feature or not in Snapmakerjs. Click here to find more details about how to change the settings. Fixed the bug that Z axis/Y axis can’t Home correctly by moving the Y axis back 2mm after hitting the limit switch. Fixed the bug that the 3D printing module landed outside of the heated bed when calibrating. Fixed the bug that the Z axis would hit the top when the slider is close to the top and it’s homing. Z axis bed leveling, Day Zero! Fixed the bug that some printers fail to upgrade the firmware using the provided USB Disk. If you have run into the USB Disk issue, please format it and make sure its file system is FAT32 before upgrading the firmware. Fixed the bug that the printer doesn’t follow commands in the jog mode after the print is stopped on the touchscreen. Fixed the bug that the printer doesn’t lock the slider of the Z axis, which leads to the X axis falling when the printer is not printing.